This year, we continue our Holiday tradition of predicting the key trends in the mobile UX industry you will have to face in the coming year. Without further ado, here’s our count-down to #1. Responsive Web Design or RWD has been a dominant trend in web industry for several years now. We predict that in 2015, RWD will be the “ticket to entry” for any content-based or Marketing website. Most major blogs, online magazines, newspapers and marketing sites will adopt RWD as the baseline design strategy. Think you have too much content? That your company’s business is too complex? In short, you can’t possibly adopt RWD in your organization? Think again. We regularly consult for Fortune 500 companies like Oracle, with over 50,000 pages of content. Last year we helped Oracle with a RWD design strategy workshop to help launch the RWD redesign of Oracle.com. Today the new Oracle.com is hailed as one of most successful recent website projects. And if Oracle can do it, so can you. Let us know if you need a little help getting started in the right direction: we recommend starting with one of our award winning workshops, and will provide detailed design help if needed. While full-spectrum RWD is the baseline for all content-based websites, many websites that help customers do stuff, like shop, search, upload content, participate in social networks, etc. are only responsive in a limited way, and will likely remain so in 2015. Heard of Amazon.com? Of course you have. Amazon.com is only responsive down to 997 pixels – the width that comfortably supports the classic Apple iPad. Amazon.com also has a dedicated mobile website, and a full complement of native mobile apps with its own visual design and information architecture. And although Amazon does not follow the “one web” dogma, it hasn’t stopped them from making a (projected) 2014 revenue of almost $100 Billion with 20+% YOY growth. Widely divergent yet highly profitable mobile strategies that help companies create the optimal offering to best serve their most valuable customers. I predict that while in 2015 mobile will only further increase in importance, while digital strategy dogma will take a beating. Following the Snowden fiasco in 2014, American government officials spectacularly failed to convince the world that letting them have full access to everyone’s digital lives is un-patriotic. Predictably, having your private data secure from any prying eyes became a priority. And with the recent cyber-attack against digital juggernaut Sony, the threat of being hacked by any organization (government or otherwise) has been made much too real. This in turn gave rise to many fake “appliances” that are supposed to make your data secure online (Ref). Few people currently know what kind of data is being transmitted and tracked by the whole suite of the native mobile apps they use on a daily basis. This is about to change. An interesting list of apps is put together by CSO Online (Ref). I predict that in 2015, both the Google Android and Apple iOS will be much more closely monitoring what your native app is doing with your data. Apple is in much better position here, because it can more easily reject apps from the app store and encrypts the internal data as discussed here. Google has a much more complex and open app ecosystem—policing it will be a serious chore. We are looking closely at Android L and the security and privacy enhancements the new Android OS will deliver. In 2015, look for apps that help users monitor their incoming and outgoing traffic and all sorts of apps that make it easy to mask user’s activity, as well as mainstream apps with options to opt out of sending any feedback or activity monitoring data. I predict this will change in 2015. One of the wearable applications I mentioned in my 3rd book, Android Design Patterns, is identity management. This is especially poignant with the security and privacy concerns mentioned in the previous section. I think 2015 will see the emergence of the wearable devices not just for notifications, (or wholly outdated and trite things like telling time) but as a convenience feature to quickly unlock the mobile device, computer, car, house, with a “decoder ring” or a “smart bracelet”. And while the lack of killer consumer applications for Google Glass continues to be the joke of the Silicon Valley, one of the medical device startups we consult, VitalMedicals, found several fantastic uses for Google Glass in the hospital operating room, as you can see in this incredible video. It is safe to say that 2015 will be the year of wearables – stay tuned! While wearables represent one end of the emerging mobile spectrum, the bread, butter (and cheese) of mobile design, full-size mobile phones, are also radically changing in 2015. With iPhone 6 Plus, Apple is finally following its more adventuresome cousin, Android, down the path of phones with larger screens. As I wrote about in Android Design Patterns book, this seemingly slight increase in size (5.5 inches) brings unique challenges in device ergonomics: customers are simply unable to reach the top action bar while holding the phone single-handed. This causes frequent and painful shifting of grip on the device. As you can see in the diagram I borrowed from my book, the hot zone for the thumb does not reach the top bar on a larger screen. This means that the new, larger device requires a radical redesign of the interface to place most commonly used functions on the bottom of the screen within easy reach of the thumb. In the case of iPhone 6 Plus, slide the entire display can down to accommodate the new ergonomic reality, with a feature Apple calls “Reachability” (enable under Accessibility, then double tap, not click, the home button to use the Reachability feature). Scott Hurff discuss the implications of Reachability in detail in his recent article, “How to design for thumbs in the Era of Huge Screens”. As larger screens become the norm in 2015, novel UI solutions to the challenges of one-handed ergonomics (such as the Floating Action Button in Google Material Design and Reachability in iPhone) will become the norm rather than exception. What looks like a marshmallow, but acts as humanity’s overlord? No, it’s not the robot from Big Hero 6. It’s Google’s Self-Driving car. And it’s just signaling the beginning of the trend. At MobX in Berlin, I overheard car company executives talking about viewing cars as a mobile phone accessories, and not the other way around! This indicates a profound shift in how in-car mobile experiences are perceived. In every one of my 50+ university courses and conference design workshops, one or more teams attempt to tackle the challenges of car mobile experience. And no wonder – the current experience leaves much to be desired and we have not, as a mobile app industry, moved past having GPS-enabled maps we had way back in 2007! This points to a tremendous unexplored mobile UX opportunity. DesignCaffeine is currently under NDA with a leader in in-car mobile experiences, and I can’t wait for the huge changes are that are coming. Mashable offers a glimpse with this article which describes ‘Minority Report’-style gesture interface in the Volkswagen concept car. 2015 will be the year when in-car experiences will come full circle, with unprecedented customization, entertainment, as well as the navigation and communication services, new pointer devices and hands-free operation. #2 Think UX Hasn’t Changed Much? Think Again. Can you afford to keep up with all the mobile changes that are coming in 2015 and beyond? Can you afford not to? Fortunately, now you don’t have to choose. With Lean Agile approaches, the cost of mobile innovation drops dramatically. Using Lean design principles you can create low-cost experiments to quickly test viability of your mobile designs with real customers. More and more of our Fortune 500 clients are adopting Lean, rapid prototyping mobile design approaches centered on potential customers. The companies that will emerge as mobile leaders in 2015 are now reaping the rewards of decreased costs of exploring multiple potential solutions, while driving unprecedented pace of innovation and enjoying the confidence in mobile development investment that comes with going Lean. I see Lean mobile design as such a major trend in 2015 – 2018, I invested 6 months to write a complete book about the Lean Agile mobile design process. I call it The $1 Prototype: A Modern Approach to Mobile UX Design and Rapid Innovation for Material Design, iOS8, and RWD, and it is now available on Amazon.com where it got 7 reviews, most of them 5 stars. With Lean design, you don’t need expensive design software, time-consuming deliverables and extensive documentation. You need simple, compelling UX design and prototyping techniques and direct customer feedback that produce immediate results. And that is exactly what my $1 Prototype book delivers. This video tells you how $1 Prototype methodology works. You simply can’t afford NOT to Go Lean in 2015! Material Design is a nice compromise between early iOS designs which featured heavily skeuomorphic buttons and panels and the currently popular “flat” design. Material Design uses a concept of “digital paper” to represent various UI elements so that there is a portion of skeuomorphism in the design language, adding depth and texture to the interface and helping the customer to figure out more easily the relationship between the design elements. 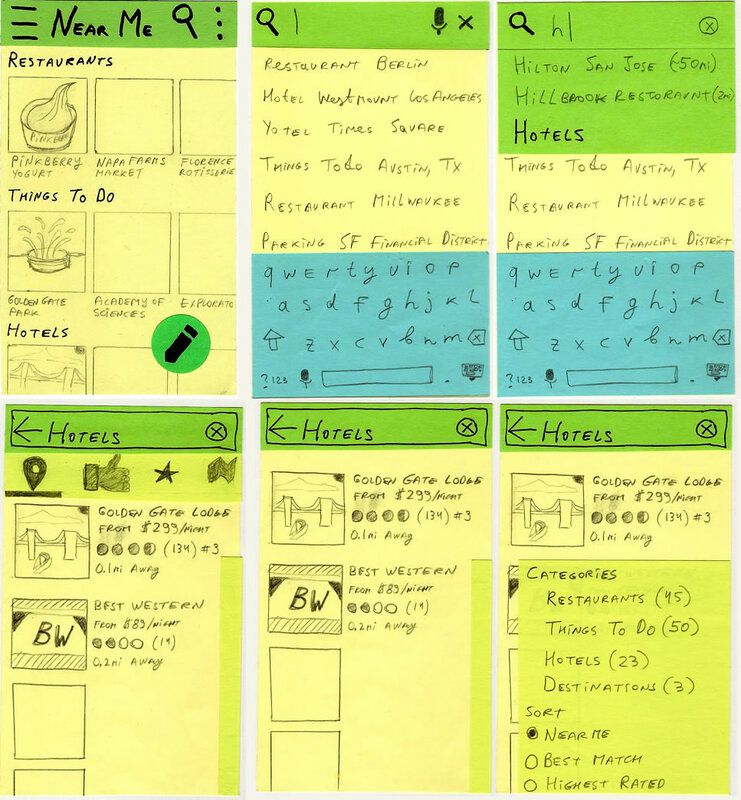 The previous version of Android – Android 4.x, used a “kitchen sink” approach to functionality, making as many options and tools as possible available to the customer using action bars, while the UI itself stepped back and often ended up looking like a gray-scale wireframe. In contrast, Material Design represents concerted effort by Google to be highly selective of functionality and lay out the “happy path” for the customer, while making the interface cleaner and more visually appealing using meaningful transitions and novel design elements like Floating Action Button (FAB). While this concludes our run-down of the key trends in 2015, you can read more about Android L Material Design in my article: Visual Guide to Android L Material Design: 7 Insights Every Serious Designer Needs to Know. Enjoy, and Good Luck in 2015! P.S. Like what you are reading? Go VIP. Join 6,000+ subscribers getting exclusive content, Q&As, book giveaways, and more. No spam. Just design that works.